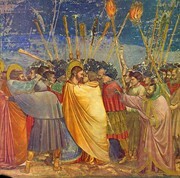 Name: "Betrayal of Christ (Kiss of Judas)"
Location: Scrovegni (Arena) Chapel, Padua. Probably the most famous picture of the famous Scrovegni Chapel frescoes, "The Betrayal of Christ" (also known as "The Kiss of Judas") was painted by the Florentine artist Giotto di Bondone (1270-1337) in the first decade of the 14th century. The venue was the private chapel of the Scrovegni family, who had grown rich from their banking and moneylending businesses. The head of the family, Enrico Scrovegni, built it on a plot of land in Padua which had formerly been the site of a Roman arena, hence it is also called the Arena Chapel. In 1300 he commissioned Giotto to decorate it with a series of fresco mural paintings - which are now considered by most art critics to mark the end of Byzantine-style medieval painting in Europe and to pave the way for the new aesthetics of the Florentine Renaissance (c.1400-90). NOTE: Giotto, reputedly the pupil of Cimabue (c.1240-1302), was the main innovative force behind pre-Renaissance painting of the Italian trecento. His close links with Florence was one reason why the city outshone its rivals in the Sienese School of painting, who remained wedded to the more decorative Byzantine-style Gothic art, with its flat picture plane and non-naturalistic figures. By 1300, Giotto's reputation was at such a height and the modernity of his vision so patently in step with the tendencies of the time that Italian princes openly competed for his services. Enrico Scrovegni was the son of Reginaldo, whom Dante casts into hell as a moneylender in his poem. Enrico must have been a considerable figure - or perhaps it was his remorse at being afflicted with the same vice of usury as his father - for Giotto to agree to provide the decoration for his chapel in Padua, which Enrico had built in the teeth of countless obstacles. His generous commission did not prevent Giotto from depicting his patron in the vast composition representing the Last Judgment on the rear of the facade. Enrico appears offering Mary Mother of God the model of his chapel and wearing a violet robe, a colour symbolizing repentance. It is naturalness rather than naturalism that is so admirable in these Scrovegni (Arena) Chapel frescoes, equally celebrated for their realism, for the physical characterization of each and every figure - a thing that had scarcely existed before him - as well as the marvellous clarity, delicacy, variety, and limpidity of their colour. The dynamism and dramatic intensity of the famous Kiss of Judas - where good and evil clash in a meeting of lips - have been stressed many times, as have the beauty of the yellow robe of the betrayer positioned between others in grey-blue and faded red, and the power of the composition generally. But it is the vibrant understanding of humanity that overrides any other quality in this powerful masterpiece, from the centre of which the figure of Christ radiates his luminous serenity. 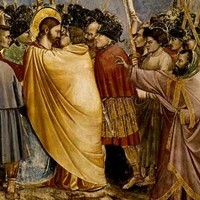 The dramatic scene depicting the betrayal of Christ shows the moment when Judas Iscariot identifies him to the watching authorities with a kiss of greeting, and at the same time, envelopes him in his cloak. As he does so, Christ calmly stares at him without flinching. Instead of relying on the sublime, Giotto softens the image of the sacred, making it feel closer, bringing it - as it were - down to earth. This new humanity is especially visible in gestures that have totally lost all liturgical quality. In spite of their dignity, solemnity, reserve, self-control, these are everyday gestures. In his earlier frescoes for the church of San Francesco at Assisi, a youthful personality was striving to express itself; in Padua, we are in the presence of total mastery and awesome power. NOTE: See also The Lamentation of Christ (c.1305) by Giotto: another scene of the fresco cycle in the Scrovegni Chapel. When it comes to assessing the importance of Giotto's Biblical art in the Scrovegni Chapel, the opinion of Giotto's pupil Cennino Cennini (c.1360-1420), author of the Treatise on Painting, is worth heeding: "Giotto translated the art of painting from Greek into Latin." This is what made Giotto a national hero: he was the promoter of a wholly new style of painting, freed from Byzantine art, from Hellenism, and reminding everyone of the glorious past of Ancient Rome. In simple terms, before Giotto began populating his religious paintings with realistic, three-dimensional people, the stiffness of figures painted in the conventional Byzantine style together with the flat one-dimensional space they occupied, made it almost impossible for the spectator to empathize or "connect" with the subject matter. Then along comes Giotto and creates real people - with real individual faces of the sort one might see in the street - and suddenly his paintings have a real impact. Giotto's naturalness and humanity would be the foundation of the Italian Renaissance, upon which Masaccio and, later, Leonardo and Michelangelo, would develop the main principles of Western art. Painting would never be the same again. Famous for the Maesta Altarpiece (1311) and Stroganoff Madonna (1300). Noted for Annunciation with St. Margaret and St. Ansanus (1333). We gratefully acknowledge the use of material from "100 Masterpieces of Painting" written by Michel Nuridsany (2006, Flammarion), a highly instructive reference for any student of visual art.  For the meaning/interpretation of other 14th century Italian paintings, see: Homepage.